Build this mini-cabin using panelized construction for less than $2000! These plans cover all exterior construction including roof decking (roofing material and interior finish is your choice), along with an interior loft and ladder. 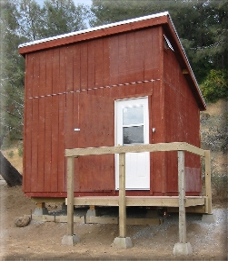 These pictures illustrate the basic steps in constructing this mini-cabin. 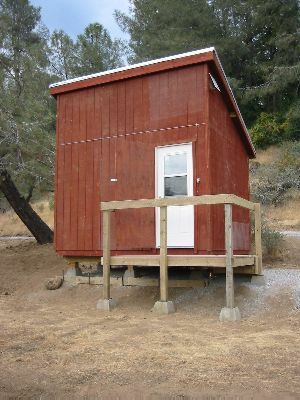 Our cost for building the cabin (excluding the deck, not included in the plans) was less than $2000, using all new construction materials, including door, windows, roofing & stain. Visit this site for books, products, tools, useful links and information for owner-builders of cabins, log homes, cottages, mini cabins, rustic retreats, barns, sheds, larger children's playhouses, tree houses, livery houses, and more!